Wild pigs (Sus scrofa), which are also named wild hogs, feral pigs and feral hogs, are very companionable animals. These gregarious creatures, with the exception of many adult males, spend the bulk of their time with others, generally in units of at least two specimens. When they communicate amongst themselves, grunting is quite a common and versatile vocalization. When a wild pig grunts, it often serves as a warning to the rest of the pigs in his unit, according to the IFAS Extension for the University of Florida. If one wild pig perceives an impending threat, such as a predator, she may notify the other pigs of the danger by grunting. When the others hear the grunt, they generally respond by immediately fleeing the scene. Some common predators of wild pigs are big cats, brown bears, raptors, snakes, people, wolves and crocodiles. Wild pigs also frequently grunt during enthusiastic feeding sessions. When these swine are racing to get as much sustenance into their bellies as possible, you may hear a lot of giddy, noisy grunting, combined with a little bit of squealing activity for good measure, as well. Wild pigs sometimes even grunt at others as a way of inviting them to join in on the feast. If a wild pig just discovered a "stash" of food, her grunt alerts the other hungry piggies to the fortunate findings. A wild pig's grunt can be as simple as a basic "hello." If a piggy has a friendly association with another member of her herd, grunting may just be her way of saying, "Hi. How have you been? Long time no see." 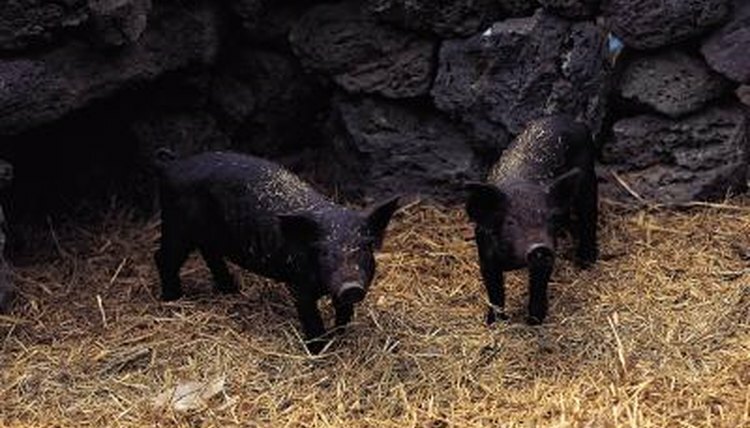 Adult male wild pigs are generally more subdued and quiet than both wee piglets and adult females, indicates the Rutgers University Extension. Despite that, wild pigs of both genders communicate through grunting and other sounds. Some other common sounds that wild pigs produce are popping, chattering of the teeth, chirruping and growling. These sounds are employed to convey an array of different things, including emotion, motive and even specific location. A wild pig may grunt as a way of encouraging someone else to visit her in a specific spot. How Fast Does a Pig Run?